In it we cover preparing the roof deck, adding the edge trims, laying the laminate and topcoating. This video about laying a GRP roof can be found on our YouTube site. At Matrix we offer a two hour training course for professional contractors. We charge £40 + VAT, payable at the time of booking. 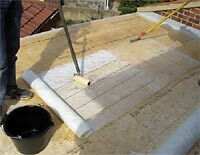 You will learn the principles of how to lay a successful fibreglass roof, including the correct preparation of boards and trims, and you will also help to laminate a small section of roof. We also cover estimating and costing, as well as what is required to be able to offer the Matrix Premium 20 year guarantee.